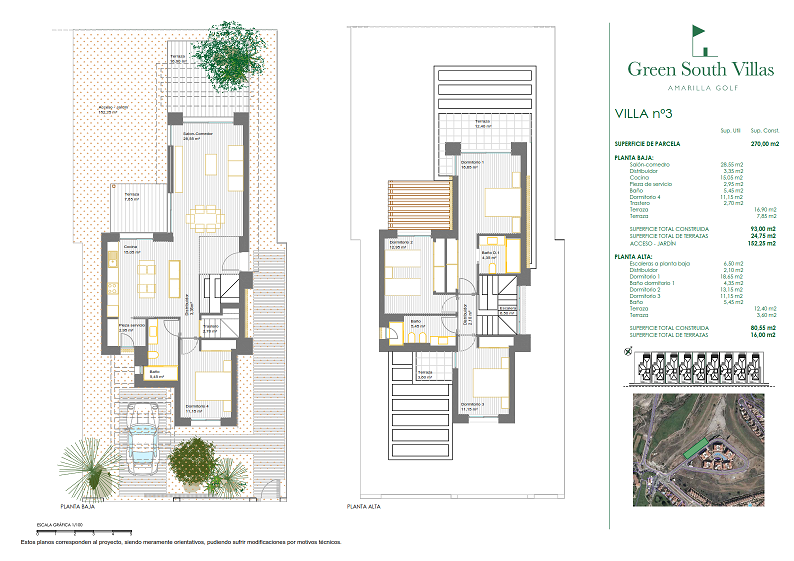 On sale 9 exclusive detached villas in Amarilla Golf! 9 exclusive linked villas in Amarilla Golf on sale! Green South Villas residential project, comprising 9 exclusive linked villas in Amarilla Golf course in south Tenerife, is one of the most beautiful settings for playing golf on the shores of the Atlantic Ocean while enjoying breathtaking views of the Teide mountains. Situated just a few metres from the Club House and beside holes 16 and 17, this new residential complex allows residents to enjoy the peaceful and relaxed lifestyle they have always dreamed of, and combine your favourite sport with other water and leisure activities. When designing the villas, the priority was to create open spaces in the day areas, make the most of the natural light and achieve a balanced and spacious layout in each of the nine villas. 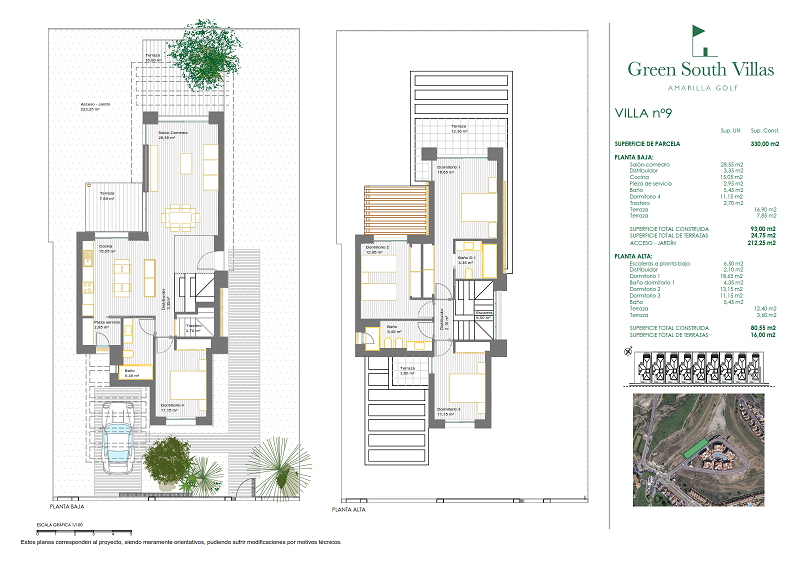 All properties in Green South Villas are linked and built at the centre of their own private 240-square-metre site. The ground floor will have a closed area of 93m² and a loft-style layout, with the lounge, dining area, hall and kitchen all laid out in a spacious ambience, creating a feeling of comfort and harmony. The ground floor will also have a toilet and utility room, as well as a storeroom, and will be directly connected to the exterior, porch area, gazebo and swimming pool. The house price does not include a swimming pool, which is optional, and for which a quote can be provided based on the client’s requirements. The upper floor will have a closed area of 80.35m² housing the master en-suite bedroom with its own 9.20-square-metre terrace and two additional bedrooms (12.95m² and 11.15m²), one with its own private terrace and bathroom. The space between the house and wall separating it from the exterior has been left free for a parking space for one vehicle, and the rest of the frontage comprises the pedestrian entrance to the villa. To the rear of the home is a landscaped area with views of the golf course and suitable for the installation of a swimming pool. 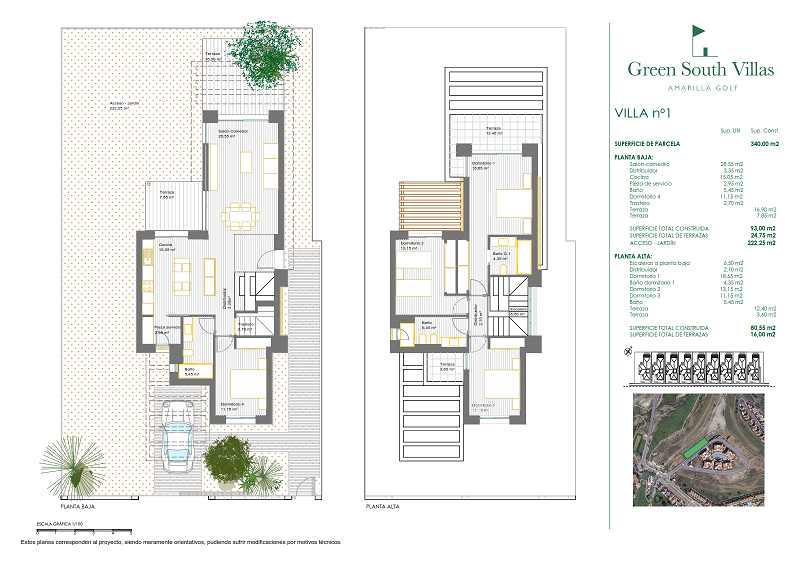 Green South Villas is an exclusive residential complex designed for long stays in which to enjoy Tenerife’s wonderful weather, without having to worry too much about maintaining the home or garden when you are not on the island. We believe our project will become an architectural landmark in Amarilla Golf course and will undoubtedly make the nine lucky families that decide to live out their dream here very happy. The Viqueira Group, a builder and property developer with more than 65 years’ experience in Galicia and the Canary Islands, will be more than happy to answer any enquiries you may have about this exciting new project. ¿Es Vigo una de las mejores ciudades para vivir?